One South Yorkshire family is reaping the benefits of a lighter and airier living space, thanks to new aluminium bi-folding doors from HWL Windows Group. Tom Hebdige lives in a newly extended five-bedroom detached property in Wath-upon-Dearne near Rotherham with his wife and young family and wanted to maximise the light in his larger living area. After being recommended HWL Windows Group by a friend, Tom realised the quality and value of bi-folding doors from the company and contacted the firm to arrange a consultation. 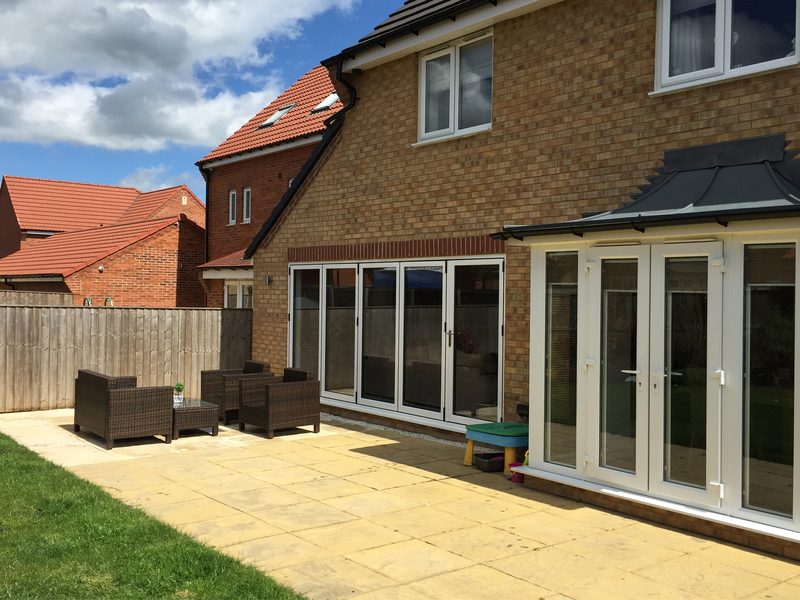 The experts recommended a total of five bi-folding doors spanning 4.3 metres to maximise the living area and to help bring the outside in. The ability to open up the whole of the back of the house was one of the main reasons why Tom chose bi-folding doors for the property. The seamless link between the home and the patio area of the garden will allow Tom’s family to make much greater use of this area as an extension to their living space. To add to the feeling of airiness inside the home and to complement its contemporary aesthetics, Tom chose white bi-folding doors for the property. HWL Windows Group offers a comprehensive range of colour options for its aluminium bi-folding doors, which are available in any RAL colour, as well as the option of different colours to interior and exterior of the doors. HWL’s bi-folding doors help to keep energy bills down, as they offer a high level of thermal performance, achieving a u-value of 1.8 W/m2K that meets all Part L requirements. HWL Windows Group pre-builds and delivers its products as a single unit. The company performs pre-checks on all of its bi-fold doors before they are delivered to customers to ensure they are in full working order before installation. Available with as many as eight doors depending on the size of the project, HWL Windows Group’s bi-folding doors have slim profiles for enhanced sightlines and a fold away concertina style for a smooth operation. HWL Windows Group has nearly 15 years’ experience in supplying doors, windows and conservatories for self-build customers and home renovators. The company offers a one-stop solution that includes design, manufacture and installation, along with two site surveys – one that is carried out during the initial quotation and another during the final manufacturing stage. For more information, call 0113 244 9006 or email sales@hlwwindows.co.uk or visit the website www.hwlwindows.co.uk/self-builders.html.